Even though it’s October (and the weather is still feeling like August…), I’m starting to think about Thanksgiving. I know, I know, but I get to host this year and I’m pumped! We’re not sure if we’ll have a big crowd or just the four of us, so I’ve got several menus floating around in my head. I knew this month’s Improv Challenge theme, Sugar and Spice, was perfect for trying out some of the recipes I’m considering. Sugar and spice is SO fall – apple spice, pumpkin spice – but I couldn’t get these nuts off my mind, so they won out. 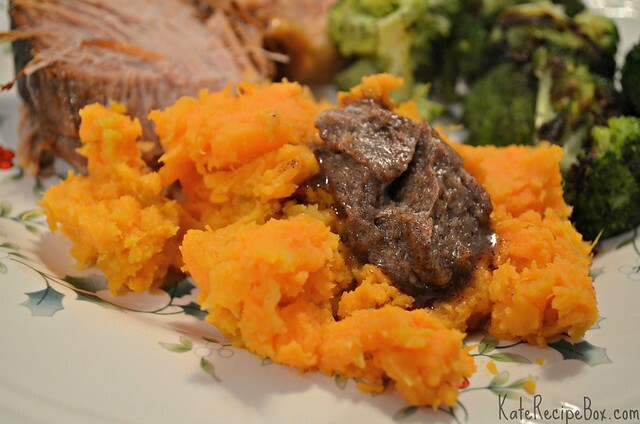 This is such an easy recipe – the slow cooker makes it totally hands off. Just mix, let the slow cooker do it’s thing, then spread them out to cool. 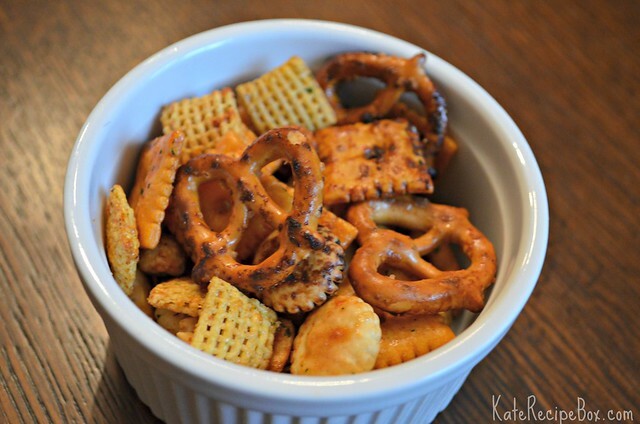 They were so good – and a perfect pre-Thanksgiving dinner snack! 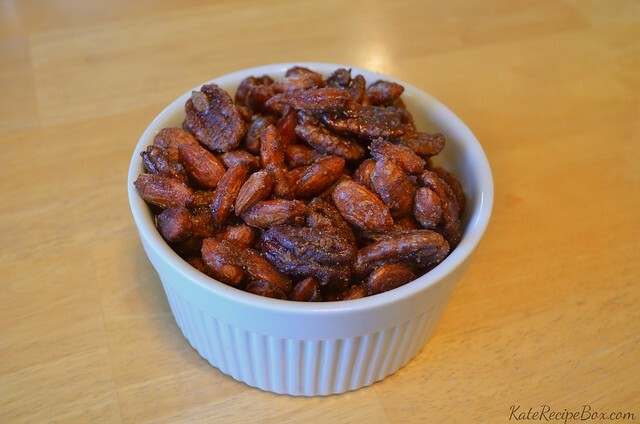 Grease the crock of a slow cooker and add the nuts. Add the sugars and cinnamon and stir. Add the water and stir until everything is evenly combined and wet. Remove nuts to a parchment-lined baking sheet to cool. Sprinkle with remaining seasonings. Once fully cooled, store in an airtight container. Just about two weeks until the Super Bowl! Are you having a party? We’re going to one with some of our best friends and I’m super excited about it. We’ve been chatting about the menu for weeks. Chili, a nacho bar, and pickle dip are all on the short list. This is a contender, too. I made this up as a Christmas day munchie and it was well received. This is a great make-ahead option and it’s done in the slow cooker, which is awesome. I used a slow cooker bag for this to aide with cleanup (it was a breeze!) but I also kept the mix in the bag while it cooled, instead of spreading it on baking sheets. I just shook the bag/ mixed it around every few minutes until it was fully cooled. Super easy and it worked perfectly! Line your slow cooker with a slow cooker bag or spray with non-stick spray. Whisk together the butter, ranch mix, Worcestershire, sugar and corn syrup in a small bowl. Mix remaining ingredients together in the slow cooker. Pour liquid mixture over and stir to coat. Cover and cook on low for 3 hours, stirring every half hour. When finished, pour the contents onto large baking sheet sand continue stirring as it cools to avoid it lumping together. Store in an airtight container. This meal was so easy! Are you sensing a theme around here? If it’s not quick and easy, I pretty much can’t handle it these days. Going forward, let’s just assume everything I post is quick and easy unless I say otherwise. On top of being easy, this is freezer friendly. I prepped and popped it in the freezer – and then thawed the day before cooking. If you’re someone who likes to prep ahead, this is a fantastic option. Place pork in the slow cooker. Combine remaining ingredients and pour over pork. Cook on low for 6 hours. I had bought chicken to make something else – and then realized that my day was entirely too busy to make what was planned. After scrambling around Pinterest for a few minutes for something I already had ingredients, I found this recipe. This is simple, but good. My toddler totally devoured it. And demanded most of the leftovers for himself. In a small bowl, whisk together the honey, Dijon and 1/4 cup water. Add the chicken to the slow cooker. Pour the honey mustard mixture over and toss to coat. Cook on low for 4 1/2 hours, remove chicken and shred. Whisk together the remaining 2 Tbsp. water and cornstarch until smooth. Whisk into the slow cooker. Return chicken and stir to coat. Cook for another 20 minutes, or until thickened. While the chicken cooks, in a medium bowl, whisk together the olive oil, vinegar, salt, pepper, Dijon, honey and sugar. Toss with red cabbage. Refrigerate until ready to serve. 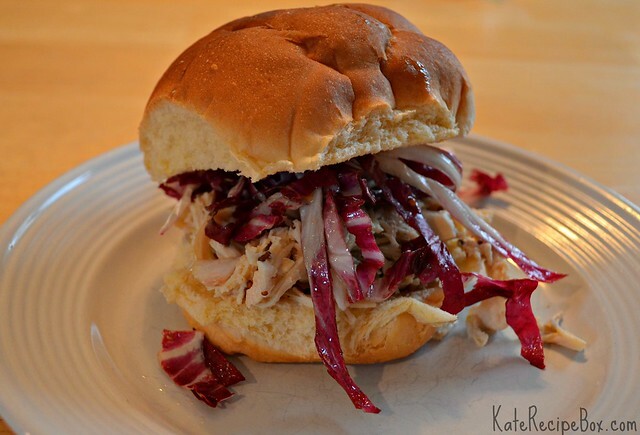 Serve pulled chicken on rolls, topped with cabbage slaw. Seven months into motherhood and I’m finally coming to terms with the fact that I can’t do everything. It been a lesson in “OR” lately. You can spend time making dinner OR go visit the adorable new twins across the street OR get another load of laundry done. You can make that nice stew that simmers all day OR go to the baby play date OR run errands at the mall. It seems that more and more, I’m pushing dinner to the back burner so I’ve been trying to plan easier, more hands-off meals. This slow cooker meal was a huge win – healthy, flavorful and quickly prepped before my busy day got out of hand. It was so nice to plop on the couch for baby cuddles instead of starting dinner after running around! In the slow cooker, whisk together the first 11 ingredients (tomato sauce to pineapple juice). Add the pork and turn to coat. Cook on low for 6-8 hours. Remove pork, shred and return to slow cooker, stirring to combine with the juices. When the pork is just about done, heat a grill pan. Grill peppers and pineapple until peppers have char marks and the pineapple is starting to caramelize. 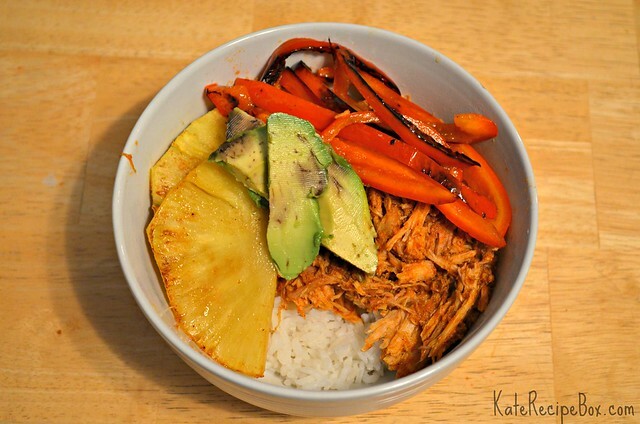 Serve pork in bowls with rice, peppers, pineapple and avocado. Most people don’t think of slow cooker meals as a summer thing, but there are plenty of great, summery recipes for the slow cooker. This one is particularly good – fresh lemon juices and herbs make up the marinade for the chicken. Pair the cooked chicken with fresh-from-the-garden tomatoes and cool tzatziki sauce for a great summer meal. This also freezes well – before or after cooking – making it a great option to stock the freezer during the warm months! Place the chicken breasts in the slow cooker. Whisk together the remaining ingredients and pour over chicken. Cook on low for 6-8 hours. 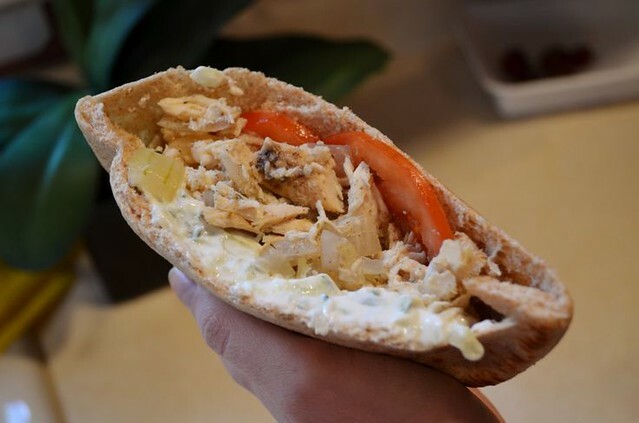 Shred and serve in pitas with tzatziki sauce and sliced tomatoes. I really can’t get enough of my slow cooker this fall. It’s being used nearly every day for something or another, it seems. So when my coworker, Dawn, mention that she tried-and-loved this chili made in the slow cooker, I couldn’t wait to try it out too. It’s really good – and really easy to toss together in the morning. It’s a little spicy, but the cream cheese cuts most of the heat. If you’re not a fan of spice, try using diced tomatoes without green chilis and less cayenne. Either way, it’s perfect for these chilly fall days! Heat olive oil in a large skillet until shimmering. Add onions and cook until translucent. Add garlic and cook for 30 seconds, or until fragrant. Add chicken to a slow cooker. Top with cooked onions. 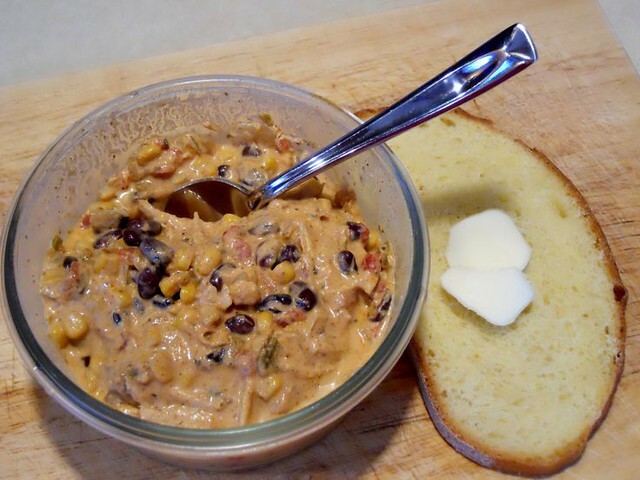 Add all ingredients except cream cheese to the slow cooker and stir to combine. Place the cream cheese on top and cover. Cook on low for 6-8 hours. Before serving, remove chicken, shred, and return to the slow cooker. 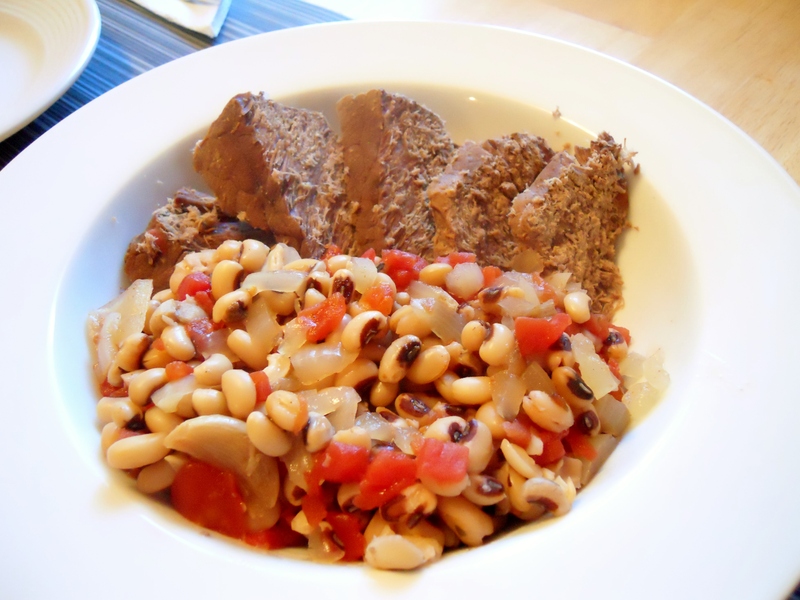 I’ve had some black-eyed peas in the pantry for a few months. I don’t cook with them often and wasn’t really sure what to do with them. This seemed like the perfect solution. The original recipe involved a bunch of pre-cooking before adding everything to the slow cooker. I adapted things slightly so I didn’t have to pre-cook to make the recipe easier for a busy day. I was really surprised how much we enjoyed this. I’m now a fan of black-eyed peas, apparently! Rub the brisket with the spice blend and place it in the slow cooker. Top with chopped onions, garlic, chicken stock and diced tomatoes. Cook on high for one hour then switch to low for another hour. Stir in black eyed peas and cook for an additional 3 1/2 hours. 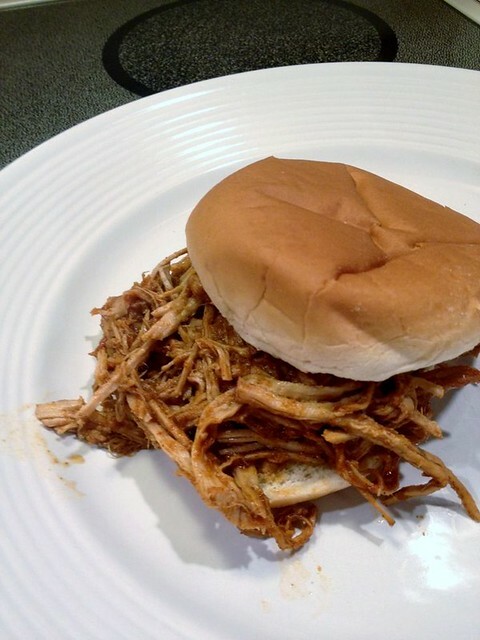 Pulled pork is such a classic slow cooker recipe. I’ve shared our go-to recipe, Crystal’s Pulled Pork, and two fun variations, Balsamic Honey Pulled Pork and Asian Style Pulled Pork. I’d never made a simple pulled pork with a classic, homemade sauce, though – something I needed to remedy during football season. This was pretty much perfect for a lazy football Sunday. Chopping the onion was the most strenuous part of the prep and it was ready to start cooking in no time. I shredded it up during halftime and we had a nice meal with minimal time away from the game. 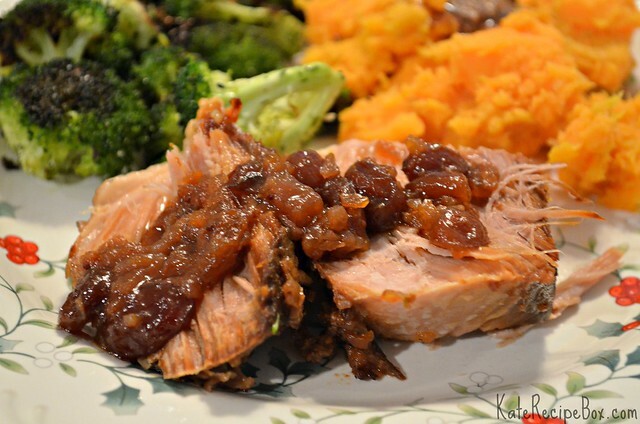 Combine all ingredients except pork and rolls in the slow cooker and mix to combine. Add the pork and cook on low for 8 hours. After 8 hours, remove pork to a cutting board and shred. Return shredded pork to slow cooker and mix with sauce.